The Portsmouth Naval Prison, now vacant, sits at the far end of the Portsmouth Naval Shipyard on Seavey Island on the Maine and New Hampshire border. For over a century, "the Castle" or "the Rock," with its deceptively appealing exterior, has kept both visitors and New Hampshire residents in its thrall. Since its opening in 1908 to its decommissioning in 1974 and into the present day, myth and lore have surrounded this iconic building. For the 66 years it functioned, any prisoner who escaped was brought back dead or alive--or so it has been said. Only adding to the prison's mystique is its history of reform; particularly successful were the wartime restoration and rehabilitation programs. 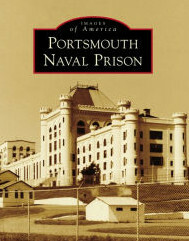 Although the prison's fearsome reputation is cemented in Darryl Ponicsan's The Last Detail, Portsmouth was a forerunner in many ways. Routine inside often reflected the latest advancements in the field. Yet, designed or deserved, the prison's legacy remains an intriguing mix of dread and redemption. The public is welcome to attend all our meetings and programs. Consider joining the Historical Society and helping preserve and protect Farmington History. Annual membership dues are $5.00.